Thx Anni n yoo !! Maed teh drum sownd ufnee 2! Him needz an eer trumpit! pfft – no use doing a big song and dance about it! Wii can haz wafflolz wif budder and maple syrple, cross antz, scrambleifyed eggz, sordid fruits, home fried taterz, sausagez, toast adn jam, adn biskitz wif gravy. Sumbunneh menshuned taht a big part of the whirrleds maplol sir up stash wus stoled frum Quebec??? Wut are we going to do!! Oh the hyooje maplol tree!! Adn, and, and, … dey gonna selling it on deh Black Market!!!! hoo noo dhere wuz a Maple Syrple Black Market???? The ivories were just too ticklish! 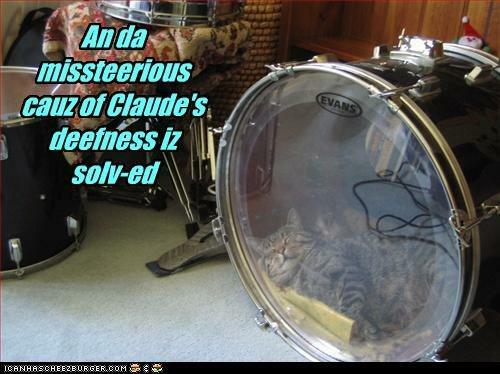 This is Claude’s plan B. What an ufnny pictyoor! Ohai an obai, peeps! Ai haz a big bizzee deeze daze… Lubs tew awl! Noes nips atz five inna morning, ai’m nawt feeding yew yetz!